Fig. 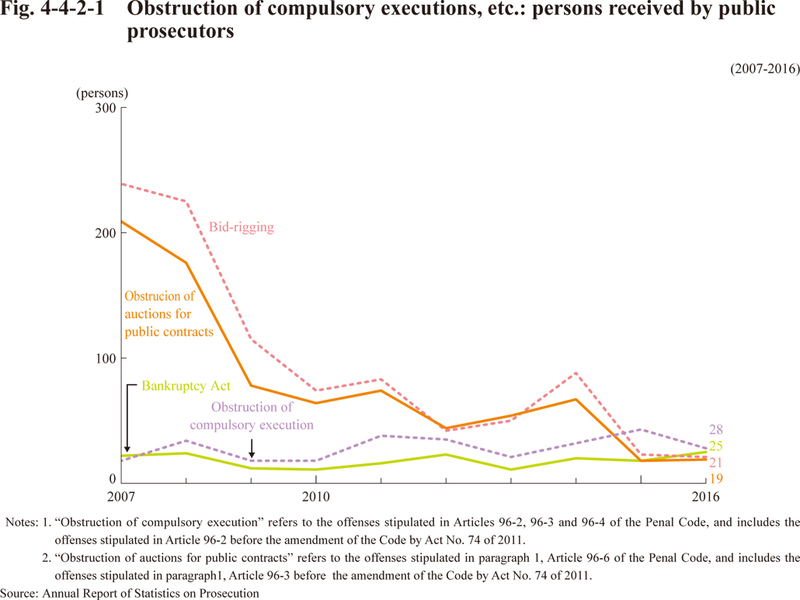 4-4-2-1 shows the trend of persons received by public prosecutors for obstruction of compulsory execution (as stipulated in Articles 96-2, 96-3 and 96-4 of the Penal Code after its amendment by Act No.74 of 2011), obstruction of auctions for public contracts (as stipulated in paragraph 1, Article 96-6 of the Penal Code after its amendment by Act No.74 of 2011), and bid-rigging (as stipulated in paragraph 2, Article 96-6 of the Penal Code after its amendment by Act No.74 of 2011), and violations of the Bankruptcy Act (Act No.75 of 2004). Fig. 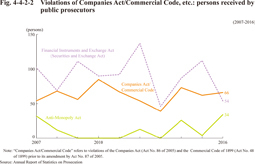 4-4-2-2 shows the trend of persons received by public prosecutors for violations of the Companies Act (Act No.86 of 2005, went into force on May 1, 2006)/Commercial Code (Act No. 48 of 1899, prior to the amendment by Act No. 87 of 2005), the Act on Prohibition of Private Monopolization and Maintenance of Fair Trade (hereinafter the “Anti-Monopoly Act, ”Act No. 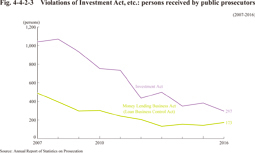 54 of 1947), and the Financial Instruments and Exchange Act (Act No. 25 of 1948. 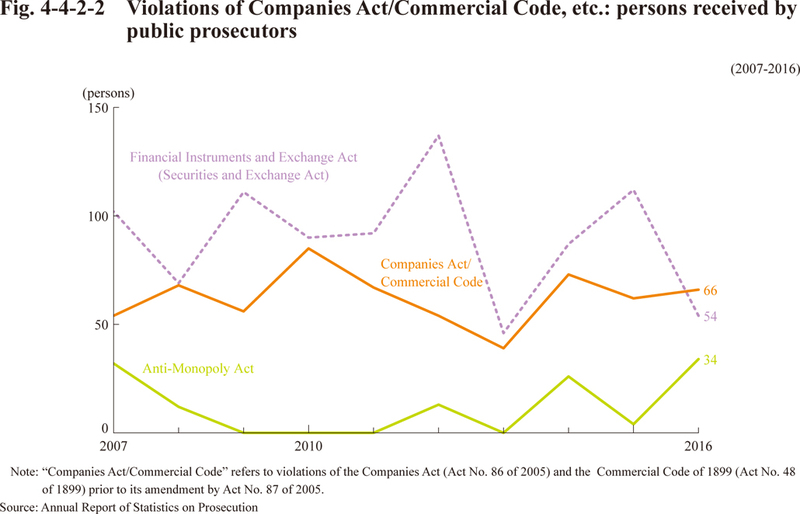 The Act was titled Securities and Exchange Act prior to the amendment on September 30, 2007). Fig. 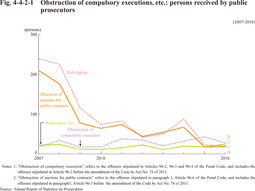 4-4-2-3 shows the trend of persons received by public prosecutors for violations of the Act Regulating the Receipt of Contributions, Receipt of Deposits and Interest Rates (hereinafter “Investment Act,” Act No. 195 of 1954) and the Money Lending Business Act (Act No. 32 of 1983. 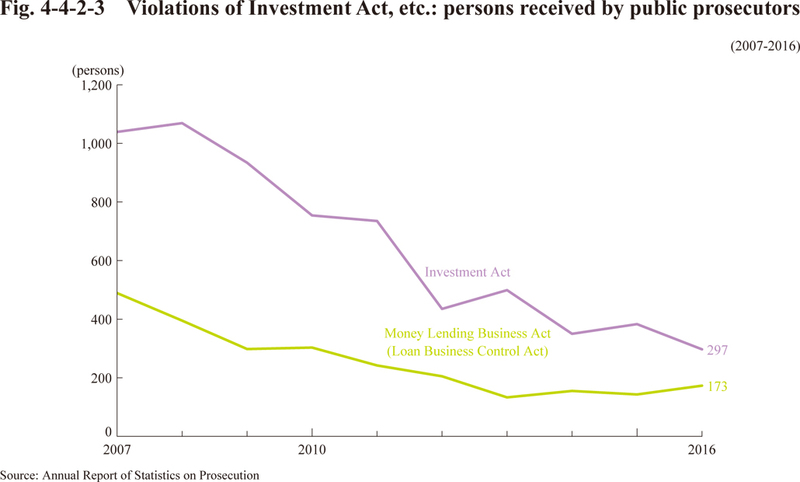 The Act was titled Loan Business Control Act prior to the amendment on December 19, 2007).